You Can't Get a Bad Meal in Italy! Jan’s travel notes record the memorable day we spent at the Villa San Michele, a short (private) bus ride from town up the hillside of Fiesole to this magnificent 15th century monestary, the façade of which was designed by Michelangelo. This is one of the Orient-Express Hotels masterpieces and should not be missed. 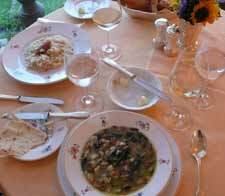 The real appeal for a day visitor is their Ristorante San Michele, and Jan’s article will do it the justice it deserves. The location, the service, the food, and the total experience remain my most vivid memory of our trip. Here is an unusual ristorante we found ourselves in: the Eurostar Italia Alta Velocita train from Milan to Florence. This proves my point: there is NO bad meal in Italy. By getting a first class ticket, one can reserve a table in the restaurant car that has a special menu made every day. Everything presented from Spaghetti al Pomodoro e Basilico and Gnocci alla Romana to the Fettine di Manzo con Rucola e Panchino (thin sliced beef fillets with rocket and cherry tomato) could not have been better. And it was brought to the table by waiters and waitresses on serving platters while traveling at 150km per hour. After a long flight from Boston to Zurich and then to Milan, getting on the Eurostar to Florence with this first meal and glass of Classico was just the right way to start our vacation. Seven days of this experience was almost too good to be true. Each meal better than the last. But to truly prove my point of this article, our last dinner in Italy was at the airport hotel called First Hotel Malpensa Airport in Milan. In order to get the early flight out the next morning, we spent the night near the airport, and arriving there at nearly 9pm, we were looking for a late dinner. The desk clerk directed us to their little restaurant in the basement that was devoid of windows, but with tables set with wine glasses and white cloth napkins. Yet another fabulous veal dish and a Caprese di bufala was a total surprise in this less-than-atmospheric setting. The desert was unbelievable: chocolate semi-fredo. The meal was so good that I made a point of telling the owner that his kitchen could match any that we experienced in our exploration of Florence-- no small feat. So, on this brief gastronomic tour of Florence, let it be said that this is truly a sensual extravaganza. The sights, sounds, tastes and sheer beauty of this ancient city will remain with you long after you leave for home. In fact, I now find myself searching the Internet for more information on the Italian Renaissance to supplant my long-lost college textbooks, and I am quite sure that any Italian meal I have from now on will in some way be compared to the ristorantes di Firenze that we enjoyed so much during this most memorable trip. Buon appetito!